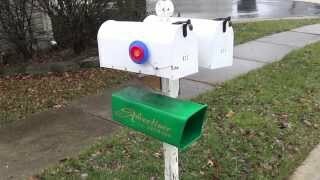 I built a triple-sensor mailbox alert to tell me when there is mail in my mailbox for me. When the mailman comes and delivers my mail, a toy mailbox inside the house raises its flag. When I go out to retrieve my mail the toy mailbox lowers its flag. If I go out again to put outgoing mail in the mailbox, the toy mailbox is smart enough to know not to raise its flag. If anything goes wrong, like the mailbox door is left open or the battery is low, the toy mailbox waves its flag as a distress signal. It’s possible to buy mailbox alerts but they’re not smart enough. All they do is detect when the mailbox door has been opened. If you’ve opened the door to put outgoing mail in your mailbox, or just to check whether the mail has been delivered, you’ll set off the alert. To eliminate the false alarms, I needed three sensors. First, I have a magnetic reed switch that detects when the mailbox door has been opened. Second, I have an infrared LED on the ceiling of the mailbox and a phototransistor on the floor; these detect whether there is mail in the mailbox. Third, I have a magnet in the flag and a magnetic reed switch inside the wall of the mailbox; they detect whether the flag is up, which means that any mail in the mailbox is outgoing. I built my own mailbox so that I could protect and conceal the electronics. The magnetic reed switch that detects the flag’s position is hidden within the side wall. Wires from the door sensor, the LED, and the phototransistor are also inside channels that were cut into the wood and then closed up when the mailbox was assembled. For the receiver, my initial plan was to have a board in a nice enclosure. A green LED would mean there’s mail, a red LED would means there’s a low battery or the mailbox door was left open, and a reset button would reset the lights. I decided that was too boring. Instead, I bought a toy mailbox at Toys R Us. I drilled a hole for an AC power cord, stuffed a DC power adapter inside the mailbox along with a slightly modified receiver board and a servo to raise and lower the flag. When the mailbox door opens, a magnet in the door closes a reed switch that provides power to the microcontroller. The first thing the microcontroller does is turn on a MOSFET that’s wired in parallel with the reed switch. So even once the door is closed, the electronics will still have power.